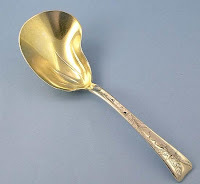 Gorham was the world's largest manufacturer of silver in the late 19th century. There are genuine collectors who want their silver to pass with them into the next world. These collectors purchase antique silver items because they like to look at it. It is passion that keeps them going. I am asked about silver as an investment by a new collector, my advice is usually to buy for enjoyment first but also appreciate the fact that the items have an intrinsic value built into them. When one gets to a level where one can afford to set aside the money to buy silver without sacrificing other things, then one can look around for art investment. It is really the same as for any other investment. You need to be able to afford to do it comfortably. I was listening to Warren Buffet talking about what he thought was a good investment and he mentioned that his rule of thumb was so clear cut - if, when you purchase something, you have an idea that the value of the item is higher than what you are about to pay, you can consider it a good investment. I think this applies to our business as well. While it might be considered a poor reflection on the dealer who may be selling an item below the true value, one should always remember that everyone has a different perception of the value and stature of a piece. In most cases, when I have purchased a piece that was almost above my head in importance and price, it has paid off nicely because someone else has realised the potential of the piece and stepped up for it when I offered it for sale at a later date. As a former stamp collector while growing up, I was always obsessed with the acquisition of the finest items in the finest condition. When the day came to sell, it was as if I was holding a fine piece of property. 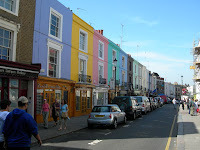 I walked into a dealer in London and he took a look at the first few examples of what I had. He handed me a pencil and paper and told me to write down and add up the catalog values. He paid me with a smile. The lesson is simply to buy the best and take the time to select examples in condition that will excite a potential buyer later when you might want to sell. As an investor you need to study and put effort into your collecting to safeguard the value. As a collector it will always please you to look at something in perfect sharp condition rather than look at something tired and worn. An example of good patination on a repousse tea caddy By S Kirk. Patina is really a myriad of fine scratches overlapping to form a fine textured surface. This surface or finish is really most desirable on an old piece of silver because it gives the silver the soft color that collectors seek. Never use petroleum based polishes on your good silver. They are usually harsh and scar the metal surface. Unless you have a lifetime to wait to restore patina through general use and exposure you should try not to have anything professionally cleaned. 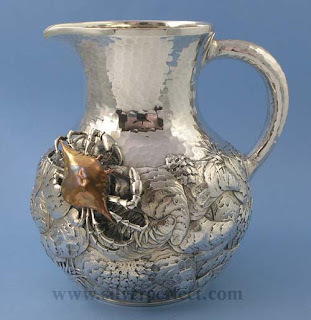 Exceptions to this would be if a good silversmith wants to restore your silver and they have to use these methods to put a finish on a piece after working on it. 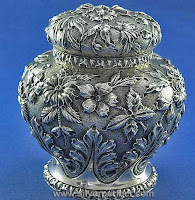 A good brand of silver polish in the form of foam or cream would be the best for cleaning antique silver. It would remove the least silver and these polishes have a silicone or wax to form a seal of protection from the atmosphere. These work best with hot water. The silver should always be left out to air dry before storing.